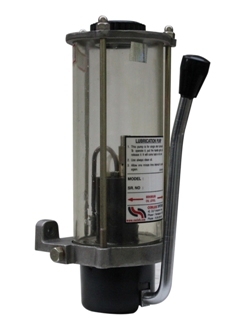 Economical, easy to use and simple to install Manual Oil Pumps. These pumps are suitable for manual centralised lubrication system of light duty automatic machines such as small power presses, packing machines, die punching machines, milling machines, single spindle automats, looms, surface grinders, pouch filling machines etc. Normally these pumps are suitable for 2-40 lubrication points and used with metering cartridges for oil distribution.